LAS VEGAS, Jan. 9, 2019 /PRNewswire/ -- A unique, immersive installation of eye-popping, flexible commercial displays from LG Electronics (LG) is wowing attendees at CES® 2019. The "LG OLED Falls" display features 260 LG OLED digital signage screens, in curved and flat configurations, giving tens of thousands of CES visitors a one-of-a-kind experience of natural wonders. A unique, immersive installation of eye-popping, flexible commercial displays from LG Electronics (LG) is wowing attendees at CES® 2019. The “LG OLED Falls” display features 260 LG OLED digital signage screens, in curved and flat configurations, giving tens of thousands of CES visitors a one-of-a-kind experience of natural wonders. Welcoming visitors to LG's sprawling CES booth adjacent to the main entrance of the Las Vegas Convention Center, stunning LG OLED Falls exhibit features 76 concave, 72 convex and 112 flat 55-inch LG OLED screens. The LG OLED Falls is a must-see CES exhibit, following in the tradition of the "LG OLED Canyon" at CES 2018 and the "LG OLED Tunnel" at CES 2017. 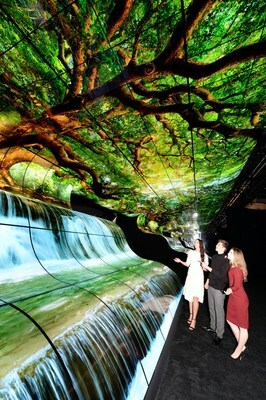 CES attendees' jaws literally drop when they see the LG OLED Falls, which measures 20 feet high and 65 feet wide, displaying alluring images of curves of the desert, waterfalls, ocean and light. The incredible video experience is further enhanced by advanced, immersive audio, which is included in 2019 LG OLED TVs for the consumer market. LG OLED technology has created a new high-end category of displays that delivers an awe-inspiring picture with perfect blacks and incredible color, even from wide viewing angles, unlike any LCD/LED display. OLED uses self-lighting pixels that can be turned on and off individually for exact control of image brightness and quality, delivering infinite contrast ration optimized for high-dynamic range content. And with no separate light source, the displays are extremely lightweight and thin, making them flexible enough to be rolled. Visitors to LG's CES 2019 booth (Las Vegas Convention Center, Central Hall #11100) this week are able to experience the LG OLED Falls display first hand. LG Electronics USA, Inc., based in Englewood Cliffs, N.J., is the North American subsidiary of LG Electronics, Inc., a $55 billion global innovator in technology and manufacturing. In the United States, LG sells a wide range of innovative home appliances, home entertainment products, mobile phones, commercial displays, air conditioning systems, solar energy solutions and vehicle components. The company's "Life's Good" marketing theme encompasses how LG is dedicated to people's happiness by exceeding expectations today and tomorrow. LG is a 2018 ENERGY STAR® Partner of the Year-Sustained Excellence. 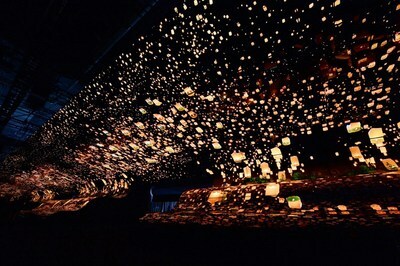 www.LG.com.